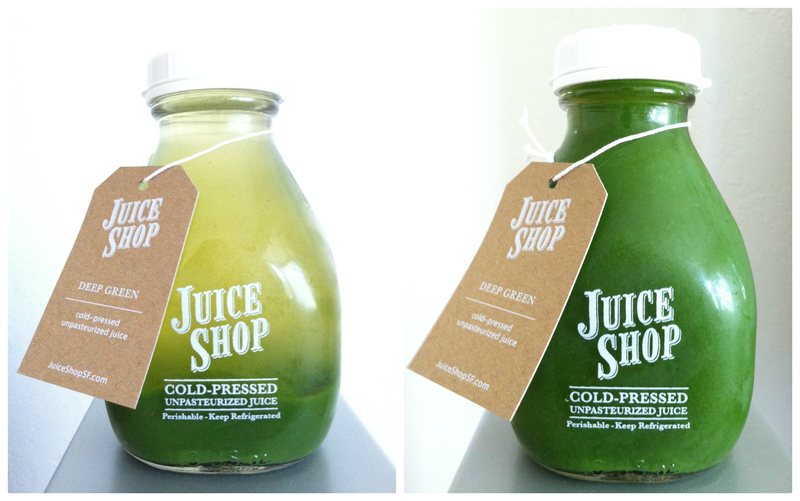 I had the opportunity to taste the green juicing series of Juice Shop SF. There will be more on this company in an upcoming post, but first and foremost, as the name indicates, they’re started by three brothers, and are local to San Francisco. Furthermore, a hydraulic press is used to extract the juice. The derivatives of this juice comes from 100% organic locally sourced produce, asides from pineapples, ginger, and tumeric, which are all organic and come from Kauai. All tastings below were poured into a Bodum glass cup to maximize the olfactory area. The order listed below is the order that I drank it in. The tastings of the first juices were completed one after the other and the third and fourth juices were completed 8 hours after. 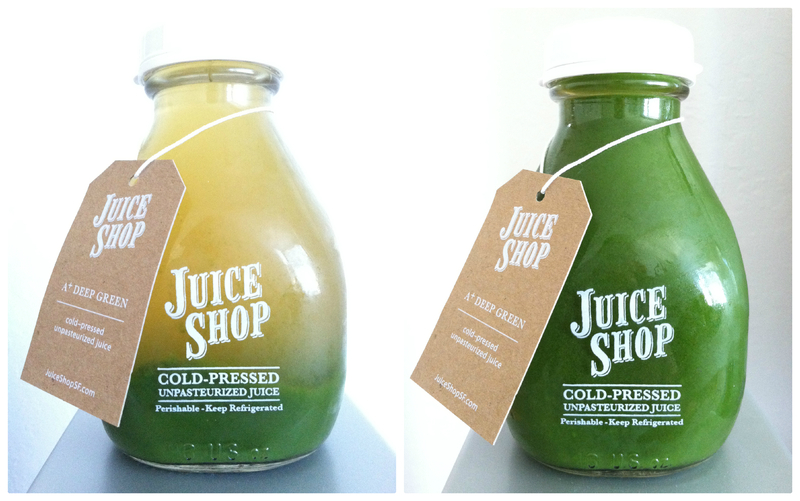 Each picture exhibits a side by side comparison with the left showcasing the juice non-shaken, and the right showing what it looks like after being shaken. As I closed my eyes and placed my nose near the opening of the cup, I could smell the freshness of the vegetables. The distinct aroma of freshly cut cucumbers was evident, slowly making its way up my nasal cavity. As the Deep Green entered my mouth chamber, I immediately recognized the taste that is so unique to celery. The parsley, if analogous to the level of a human voice, was a baby whisper. The taste of spinach, was harder to make out, which is understandable since it doesn’t overpower in any category. The purpose of romaine was nutritional as the lettuce itself is used in salads for crunch. Underneath the taste of celery sneaks in the boldness of the kale. This recipe, dominated mainly by leafy vegetables is wonderfully balanced by the cucumber and lemon. This ultimately means that the sourness of the lemon isn’t as pronounced and the cucumber can not be distinguished by taste; however both serve their role by neutralizing the vegetables. A few seconds after swallowing, there was a hint of lemon in the aftertaste, followed by the stagnant taste of celery. For my first experience of tasting a “juicing” it was quite positive, as it exceeded my expectations of what I’d imagine from a blend of kale, spinach, parsley, romaine, and celery. The texture is exactly like water, and even though the residue is visible, it played no part in roughing up the texture of this beautiful blend. I saved this for second, hoping that it would taste less like vegetables compared to Deep Green. I’ve actually never knowingly tasted burdock roots, so the pure guess was that it’d be like taro. If you’re not familiar with the burdock root or name, it is actually quite popular in Asian culture (usually via the julienne cut). Prior to shaking the juice, the liquid is actually more yellow than the Deep Green. The smell compared to that of the deep green is different since the lemon and cucumber is diminished. The bitterness was pronounced, which didn’t surprise me, given the nature dandelion greens, mentioned in the post here. This juice has less of an immediate taste when being swallowed but has quite the aftertaste, which is attributable to the burdock root and dandelion green combination. The aftertaste is stringent that leaves you smacking your lips and snapping the tip of your tongue to the rough of your mouth. Interestingly enough, the texture is exactly the same as Deep Green. Liver-Aid poses a challenge in swallowing and enjoying compared to the Deep Green. The differentiating factor in the name of A+ Deep Green and the prior drink is the A+. If the A+ is any indicator of superiority, then I’d have to wholeheartedly agree. It could be referring to the extra dose of apple, since it’s written twice. It smells better than the deep green by the tiniest of margins. The cucumber is still pronounced and is now paired with a hint of apple. This fruit is more prominent in stimulating our taste buds than our nasal canal. I experienced more tang to this flavor due to the apple. Although the ingredients still are clearly dominated by vegetables, the addition of apple is able to neutralize the taste of vegetables. 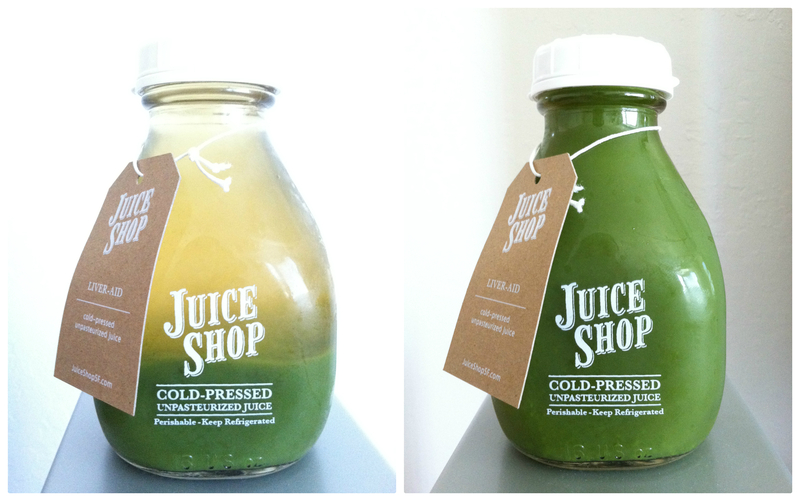 The texture is still the same as the prior two juices. I’m very impressed by the consistency. I saved the juice, which I thought would be the best, for last. As indicated by the ingredients, the only vegetable left from A+ Deep Green here is kale, with an addition of pineapple and ginger; cucumber is also not available. I categorized this as a green “fruit” juice, and I imagined it to be full of contrasting yet complimentary flavors. The moment I uncapped the bottle, I immediately smelled the spicy and rich aroma of ginger. 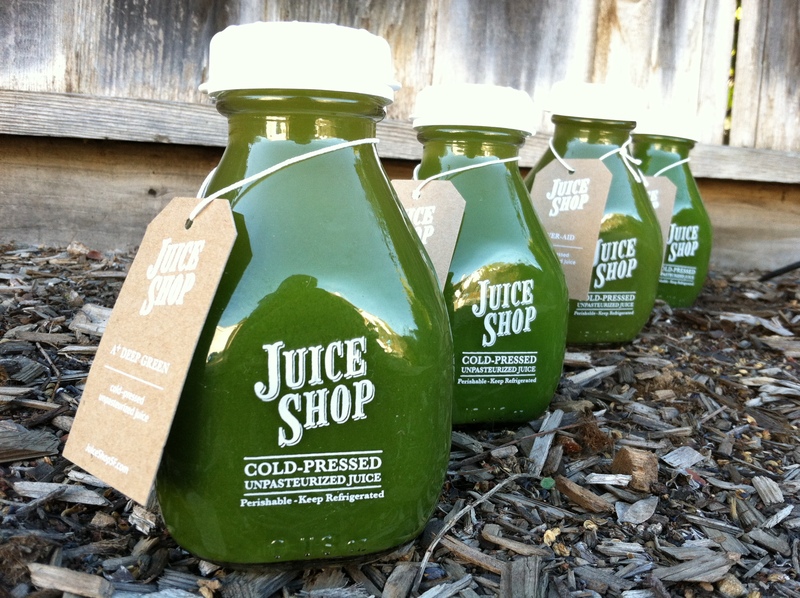 The gingers the JuiceShopSF team uses are the young gingers, not the aged ones. Excited, I took a sip, and smiled. The ginger is implicit rather than explicit, because I could still taste the pineapple and apple. The spiciness of the ginger stayed tingling in my mouth, after the taste of pineapple and apple subsided. Once again, this was the texture of water and was clearly a work of art. 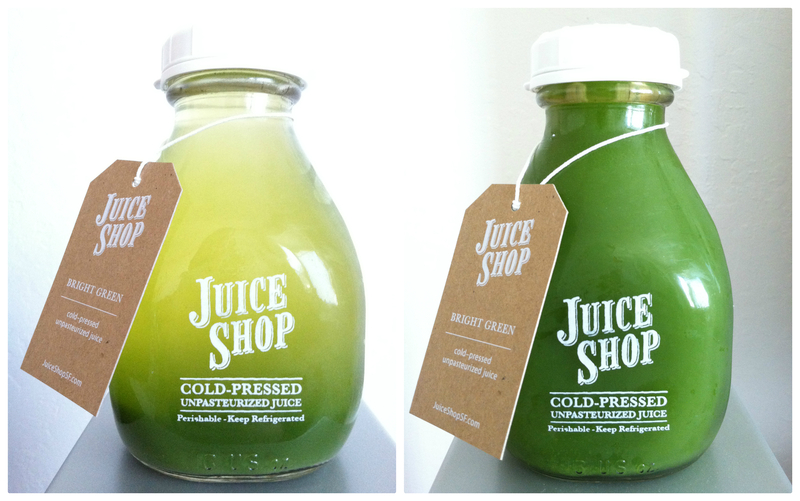 Stay tuned for a behind-the-scenes interview with the founders of Juice Shop SF!